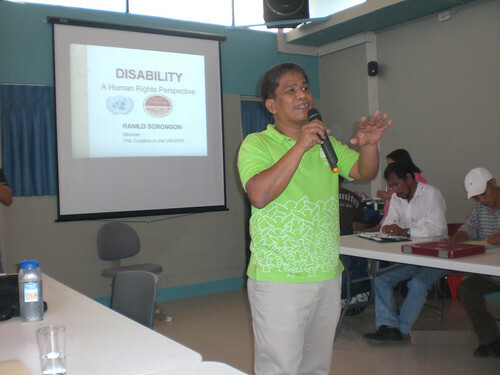 Even with the ratification of the Philippines of the United Nations Convention on the Rights of Persons with Disabilities (UNCRPD) in 2008, persons with disabilities and their advocates are still facing a gigantic task of changing the perspective of Filipinos even persons with disabilities and duty bearers to have a human rights perspective in dealing with persons with disabilities. To promote the human rights perspective, ASP Executive Director Ranil Sorongon has been tasked by the Philippine Coalition on the UNCRPD to develop a module on the said topic and lead in giving this lecture in the consultation-workshop on the Implementation and Monitoring of the UNCRPD in the Philippines. The coalition has been doing the consultation in Lipa, Batangas, Zamboanga City, Cagayan de Oro City, Baguio City, Naga City and Metro Manila. Last June 15, Director Sorongon gave a lecture-workshop on "Disability: A Human Rights Perspective" at the Norfil Training Center in Quezon City participated by more than 25th persons with disabilities, leaders, parents of children with disabilities and social workers coming from the different cities and one municipality of Metro Manila. The lecture was part of the module of the two day consultation-workshop sponsored by the Philippine Coalition. Director Sorongon also gave this lecture during the conference sponsored by the Catholic Handicap in Paco Catholic School and during ASP orientations to educate its members about this new perspective. The Philippine Coalition is scheduling the same consultation-workshop exclusively for parents of children with disabilities this August to educate and consult the parents on the implementation of the UNCRPD. Parent leaders coming different organizations all over the country will be giving an opportunity to meet each other share how the government is implementing the convention.